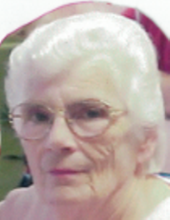 ROSEDALE-Pearl Irene Nevins, 82, of Rosedale, Indiana began her eternal rest on Thursday, March 28, 2019 due to complications with influenza and pneumonia. Pearl was born on December 3, 1936 in Terre Haute, Indiana to Albert and Pearl Brazzell Jones. She was preceded in death by her husband of 49 years Arthur Leroy Nevins whom she married April 21, 1956 in Rosedale . Survivors include three children Lynn (Chuck) Garred of Rosedale; Rick (Brenda) of Martinsville and Duane (Toni) of Rosedale; one sister, Virginia Davis of Terre Haute; eight grandchildren, Matt (Meghan) Garred, Tara Garred, Richard (Shelby) Nevins, Christine Nevins, Zach Nevins, Bradley Hendricks, Meghan Nevins and Alex McClain; three great-grandchildren, Deegan Garred, Juniper French, and Greyson Nevins. Pearl was a 1955 graduate of Otter Creek High School in Terre Haute, Indiana. She retired from the Root’s Store and Macy’s retail clothing chain. Her interest included spending time with family and being an active member of the Rosedale Baptist Church as a member of the choir. Services will be 11:00 am Wednesday, April 3, at Cottrell-Gooch Funeral Home, 287 N. Main Street, Rosedale, with Pastor Randy McPike officiating. Burial will follow at Rosedale Cemetery. Visitation is from 4pm-8PM Tuesday at Cottrell-Gooch Funeral Home. To send flowers or a remembrance gift to the family of Pearl Irene Nevins, please visit our Tribute Store. "Email Address" would like to share the life celebration of Pearl Irene Nevins. Click on the "link" to go to share a favorite memory or leave a condolence message for the family.